The Legion of Honor was founded for the purpose of bringing together a select few out of the millions who have knelt at the altar of DeMolay. Legion of Honor recipients must have actively demonstrated outstanding leadership in some field of endeavor, whether it be a civic, professional, fraternal or spiritual arena. It consists of men who can be implicitly relied upon, as the years pass, to aid young men in carrying the ideals of DeMolay into every walk of life. The Legion’s mission is to consecrate the hearts and minds of its members to an unfaltering belief of God, support of the public schools, and defense of the rights of all. A DeMolay legionnaire can be of great assistance to the Order. His leadership is needed to guide the young men of today who are learning those teachings that have helped guide his life. One man alone may falter, but, united, legionnaires can expand and extend their abilities, interests and leadership, building a foundation of service and accepting the responsibilities and tradition. Legionnaires throughout DeMolay have been united in Preceptories, carrying out their responsibilities by extending their leadership to DeMolay. 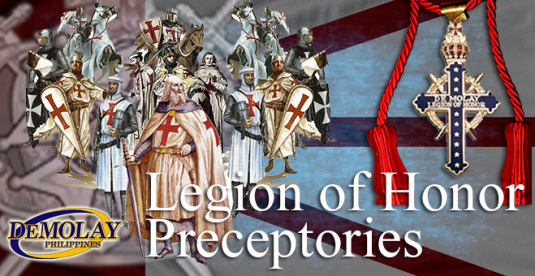 All members of the Preceptory must be legionnaires, either active or honorary. Each legionnaire should be a participating member, have observed last March 18 and mailed his required observance report to the Service and Leadership Center. The function of the Preceptory is to assist the Executive Officer in conferring the Legion of Honor Degree on those elected by Supreme Council Order of DeMolay and to help the Executive Officer in any other manner he might desire. A Preceptory may develop a program and dinner for the annual observance on March 18, and carry out some of the following activities to aid DeMolay, provided clearance first has been obtained from the Executive Officer. Assist the Executive Officer in ways such as finding advisors, and planning and promoting a successful conclave. Serve as Advisors when needed and officially register as such. Aid Chapters with membership programs, sponsor activities, and encourage and support Leadership Training Conferences. Help DeMolays find summer and regular employment. Gather a group of interested Legion of Honor members. Request the authorization from the Executive Officer to organize, noting those interested in joining. When authorized, elect officers as listed previously. Plan a program of activities. A Preceptory should establish a meeting schedule which includes the annual observance on March 18. The pride and honor of being a legionnaire can best be shown in service to the Order. Sample Preceptory bylaws can be found in the appendix of DeMolay International’s By-laws, Rules and Regulations.